I can't believe I'm 3 reviews in and I haven't reviewed anything matcha yet. Matcha (finely ground Japanese green tea) is my favorite flavor. It's perfect for ice cream, chocolate, bread, cookies, noodles, pretty much anything. Meiji really has matcha "chocolate" down to an art. The taste is hard to describe if you've never had it before, but imagine smelling a cup of green tea, only with added bitterness and sugar. 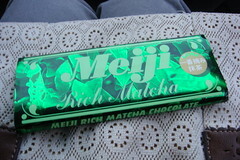 The Meiji Rich Matcha chocolate bar is matcha at its affordable finest. The pale green color is perfect, the aroma is strong and sweet, the chocolate is smooth and melty, and the matcha flavor is simply divine. This bar is on the stronger side of matcha, so if you're not a fan of the taste, you might try the Meiji strawberry bar. LOTTE also has a matcha bar, but Meiji's is much better. Definitely go with Meiji. Unfortunately, matcha is a bit of a seasonal flavor in Japan. Some matcha items are available all the time, but the best time is winter. Everyone rolls out the matcha stuff in winter. I don't know if this candy bar is available all year, but I hope it is. It's paradise.